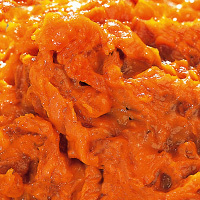 Neri-uni is sea urchin preserved in salt or alcohol along with other flavor additives that can be bought by the bottle. It is more affordable than tsubu-uni making it more viable for use in cooking. It is said to contain as much as 60 percent the cholesterol content of salted salmon roe. The calories in Neri-Uni per 60g(1jar) is 102 calories. Neri-Uni is calculated to be 170Cal per 100 grams making 80Cal equivalent to 47.06g with 13.44g of mostly carbohydrates、8.1g of protein、1.74g of fat in 60g while being rich in vitamins and minerals such as Vitamin B12 and Sodium.